Functions – Function notation, Domain, Range, Vertical line test. Inequalities – Graphing inequalities in two variable. Dotted line vs. shaded line, test point. On the back I put a place for their name and extra notes. The notes section was a new addition to this type of foldable for me and one of my favorite parts! I go over the graphic organizer in class, giving them examples to work for most of the sections. After we were finished, I had them turn the graphic organizer over and write notes on the back. I suggested that they could take notes of things they wanted to remember, or about the topics they felt they needed to focus on when studying. It was good to do this after the review because what they were unclear about was fresh in their heads. I then had a few students share what they wrote. This was helpful to other students. Some of them wrote extra items as other students read their notes out in class. I had much higher than usual scores on this test (and more students scoring higher as well). Considering that this is one of our more difficult topics of the year, I feel that this foldable really helped the students! 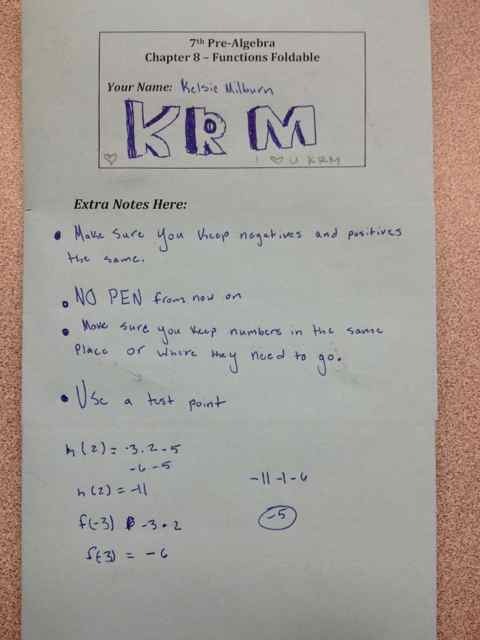 Note: I did not include how to write linear equations because my students are solid in this area. We added examples when we went over this in class. 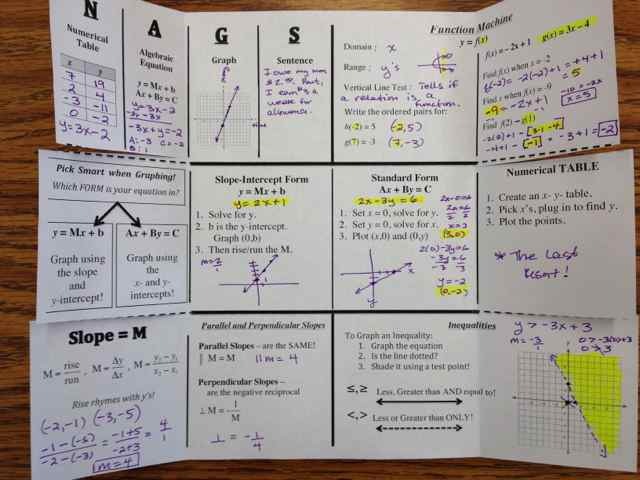 To use: This is a double sided foldable. You will need to print both side, being sure to line the correct word up with the inside when you print it out. Students will need to only fold the outside two flaps and then cut on the dotted lines. 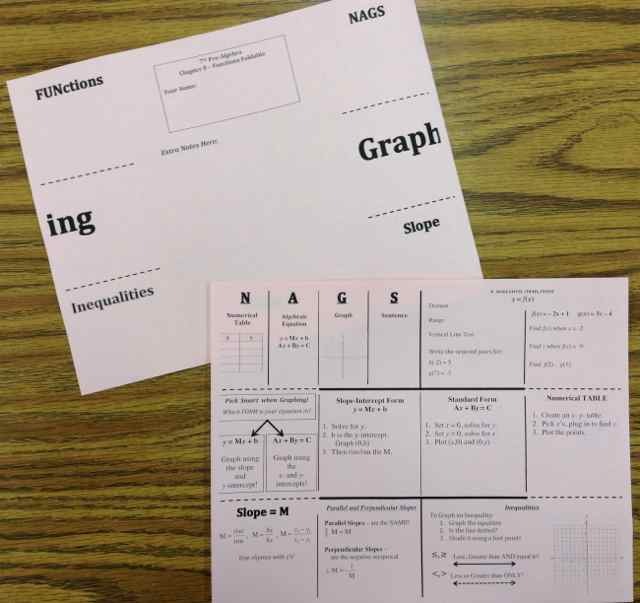 File to print out: 7th Chapter 8 Review Foldable – Graphing PDF or one you can edit from Box. 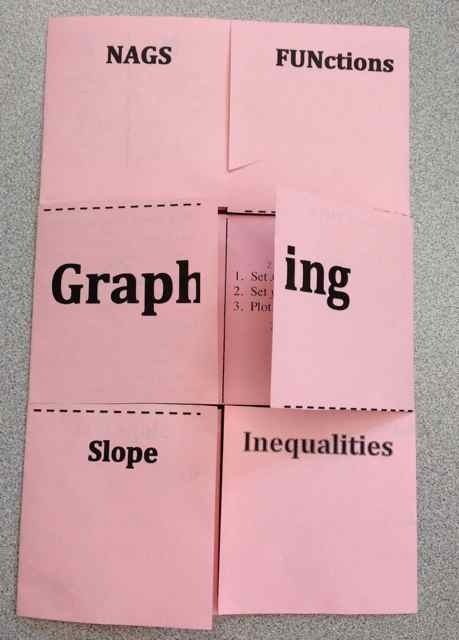 This entry was posted in Foldables, Pre-Algebra, Test Reviews and tagged foldable, functions, graphic organizer, pre-algebra, review by I Speak Math. Bookmark the permalink. Julie, this looks great. I would love to adapt it for use with my 8th graders. Would you be willing to upload a file that could be edited? I love this! Thank you so much for posting a version that can be edited. You have an awesome site! This is so awesome! I am LOVING your blog!! Can’t wait to see what else you post! I am definitely stealing this. I love the editable idea, I’m in the UK and our terminology is a little different to what you use. This is great, thanks so much! I teach 6th and 7th grade so I like to type some of it for them. Some students at that age still write very slowly or are rather sloppy. I always have them hi-light things I have typed and they do an example for each section. So, this becomes more of a guided activity. I totally give partial notes…I tell them I’m more interested in them understanding than taking the time to just copy stuff. Thank you, thank you! Teachers need more of these opportunities to share & collaborate with the world. Lots of awesome ideas out there. I love your foldable and can’t wait to try them out! Thank you for sharing! I printed for my daughter for review.